Copies of a book published by the Selangor Islamic Council (Mais) on the threat of Christianisation and alleged evangelism among Muslims in Malaysia were distributed to more than 1,000 students who attended a seminar on the use of the word Allah and Christology at Universiti Teknologi Mara (UiTM) yesterday. The book "Pendedahan Agenda Kristian" (Exposing the Christian agenda‎) was handed out to the students along with another book, "Obligation to preserve the sanctity of the name Allah"‎, which is also published by Mais. "Pendedahan Agenda Kristian", a 120-page book, has five chapters which talk about what the Quran says about Christians, the laws about proselytisation among Muslims as well as Christian evangelism. It warns Muslims to watch out for "tricks" by Christians to sway Muslims from their faith. The book also claims that the main reason there is apostasy among Muslims ‎is because of Christianisation. "The problem of Muslims converting to Hinduism and Buddhism is identified to be because of marriage and love relationships," the book reads. "But from the three religions, only Christians are found to be actively using missionaries to convert others, especially Muslims." The Christianisation movement, it said, is a very well-planned mission which consists of a "mastermind" who plans the proselytisation movement and strategies. "This is what makes them so slick in their work. They are actively doing mission work on the quiet." The book "Obligation to preserve the sanctity of the name Allah‎", meanwhile, explains to Muslims why non-Muslims, in particular the Christians, cannot be allowed to use the word Allah. This is in light of the tussle over the Arabic word – which means God – between the Catholic church and the federal government. The Catholics are seeking to overturn a Home Ministry ban on the use of the word in their weekly publication, Herald, ‎while Putrajaya has insisted that the word Allah is exclusively for the Muslims. ‎The seminar yesterday was jointly organised by the Academy of Contemporary Islamic Studies, UiTM, Warisan Ibnu Aaby and the Selangor Islamic Council with the support of Utusan Malaysia, Kumpulan Karangkraf, TV Al-Hijrah, Zikay Group and Pantai Bharu Group of Companies. 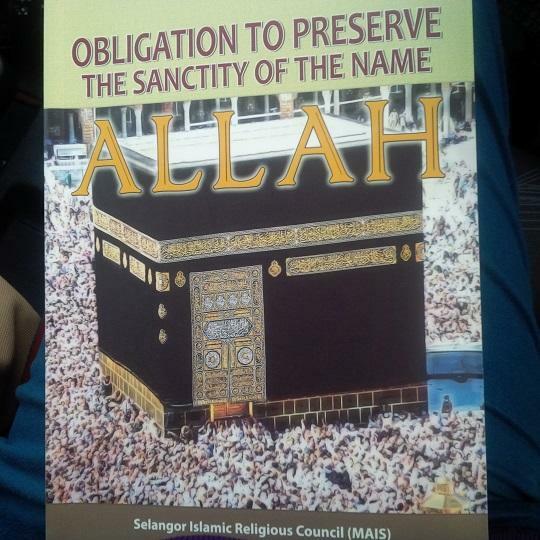 The book titled 'Obligation to preserve the sanctity of the name Allah' seeks to explain why non-Muslims cannot use the word Allah. – The Malaysian Insider pic, May 7, 2014. UiTM said the seminar was organised to increase the understanding of Muslims about the issues concerning the hotly-debated Kalimah Allah issue. The speakers included Pertubuhan Muafakat Sejahtera Masyarakat Malaysia (Muafakat) secretaty-general Abdul Karim Omar‎, and Indonesians Masyud SM, Irena Handono‎, Menachem Ali and Insan LS Mokoginta. Irena and Insan are former Catholic clerics who embraced Islam in 1983 and 1976 respectively‎. Part of the seminar included a forum titled "Christianisation vs Islamisation‎: Where does it lead?" – where the speakers answered pre-prepared questions mainly on Christian beliefs and the Bible. The questions included: "Did Jesus really die on the cross for the forgiveness of sins? ", "What is the Trinity? ", "Why did Jesus cry 'Eloi, Eloi, Lama Sabachthani (Aramaic for "My God, my God, why have You forsaken Me?") while on the cross?". Insan told the audience that Jesus really did die on the cross but disputed that He had died for the forgiveness of sins, as believed by Christians. ‎"Jesus died because of the greed and jealousy of religious leaders at that time‎." "But if Jesus was God, why did he call out 'Eloi Eloi ‎Lama Sabachthani'? He was calling for God so how can he himself be God?" he questioned. ‎Pointing out that this was an integral part of Christianity, Insan claimed that their faith was in vain because of these questions. – May 7, 2014.